U.S. To Open Immigrant Family Detention Centers In Response To Influx : The Two-Way The Obama administration says it will boost enforcement efforts — and try to dispel beliefs among migrants that new U.S. policies allow them to enter the country illegally. 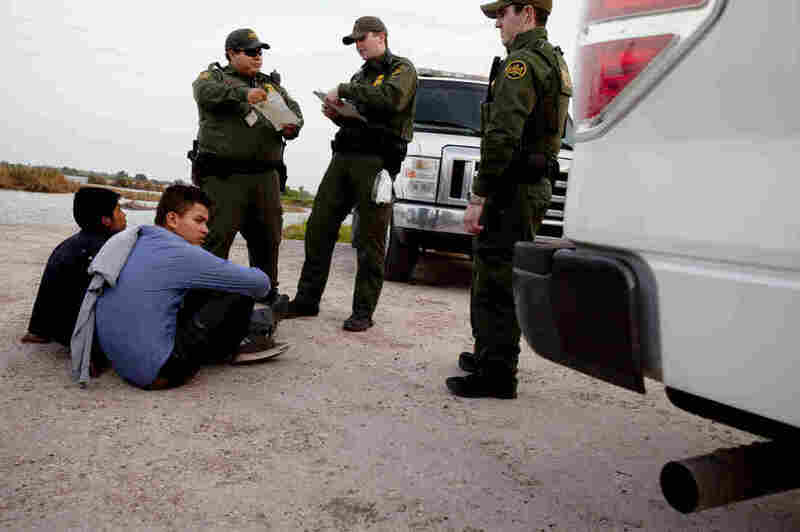 Young migrants seen apprehended by the Border Patrol near the Rio Grande in Hidalgo, TX, earlier this year. The next stop for many is either a detention center or deportation. Citing a rise in the number of children and families attempting to immigrate into the Southwestern U.S. illegally, the Obama administration says it will use new detention facilities to house the families. The administration says it will boost enforcement efforts and speed up removal proceedings. And it will try to dispel a notion among some migrants that current U.S. policies allow them to enter the country illegally. That belief was mentioned in a recent Los Angeles Times story that cited an internal Border Patrol study. After speaking with hundreds of migrants, officials wrote, "A high percentage of the subjects interviewed stated their family members in the U.S. urged them to travel immediately, because the United States government was only issuing immigration 'permisos' until the end of June 2014." Earlier this week, reports of an influx of migrants from Central America led officials in Texas to launch a surge in enforcement to secure its border with Mexico. Specifics about the White House's new plan — including the facilities' locations and the number of families allowed to enter the U.S. — aren't yet public. We'll update our reporting when that information is available. "The Homeland Security Department did not immediately say how many families would be kept in the new immigration jails or where they will be located. "The administration has released an unspecified number of such families into the U.S. in the past several months with instructions to report later to Immigration and Customs Enforcement offices, but it won't say how many it has released or how many subsequently appeared as ordered." Officials from Homeland Security tell The New York Times that they're using more electronic monitoring devices, such as ankle bracelets, to track migrants who are released. The newspaper reports that most of the cases are centered in the Rio Grande Valley in Texas. To target rumors of a newly lax enforcement policy, the White House says it will "reinforce that recently arriving children and individuals are not eligible for programs like Deferred Action for Childhood Arrivals, commonly called DACA, and earned citizenship provisions in comprehensive immigration reform currently under consideration in the Congress." "Our first priority is to manage the urgent humanitarian situation by making sure these children are housed, fed, and receive any necessary medical treatment. We also are taking steps to improve enforcement and partnering with our Central American counterparts in three key areas: combating gang violence and strengthening citizen security, spurring economic development, and improving capacity to receive and reintegrate returned families and children."